There is a network of small unmanned radio facilities on the mountaintops around the Nellis Ranges and Area 51. They are part of the ACMI Range System, which is used to provide real-time 3D position data for aircraft during the Red Flag exercises, and quite possibly also for test flights out of Area 51. The sites are usually unmanned, and only occasionally serviced by a helicopter crew. The electronics module is powered by a solar panel, which is buffered by a good size battery pack. 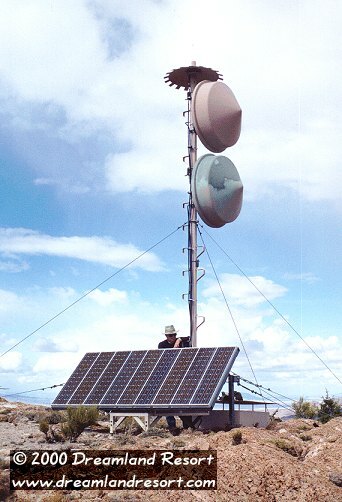 In the photo on the left the electronics module is at the foot of the antenna pole, covered by the solar panel array. The battery pack can be seen behind it, in the square metal case that is covered with a metal shield to keep it from overheating in the sun. This site used to be on Flat Top, north of Queen City Summit. The dishes were pointed southeast, towards Mount Irish. In September 2001 we discovered that this site was completely gone. Aparently the system has been replaced by a newer version with the central hub in a different location, possibly in the vicinity of Pioche. A very similar site is located on Badger Mountain. It, too, is no longer used, but has been replaced by a newer system right next to it.